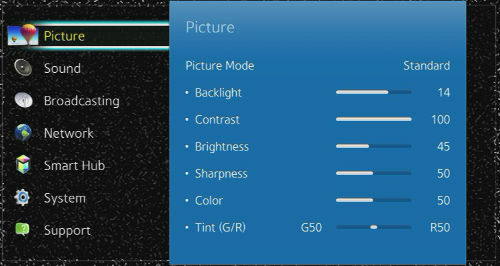 Film Mode is used to smooth out frame transitions while watching a video that is being processed using 3:2 pulldown technology. Film mode is only available with a 480i signal. Turn your TV on and press the MENU button to open the main menu. The Picture section will be highlighted by default. 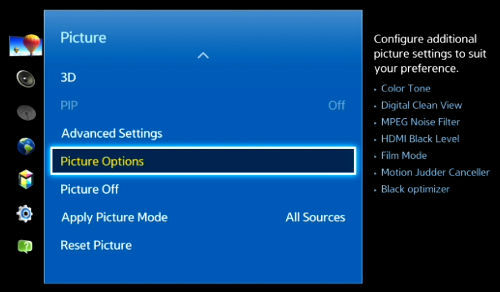 Press right on the navigation pad on your remote control to access the Picture menu. 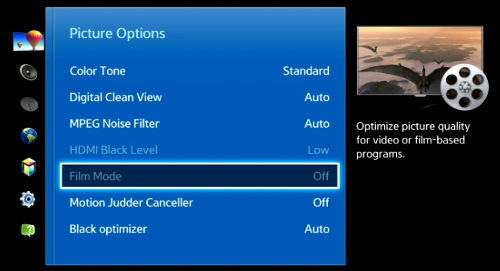 Press down on the navigation pad on your remote control until Film Mode is highlighted and then select it. You will have three options: Off, Auto 1, and Auto 2. Use the navigation pad to select the option you would like to use. 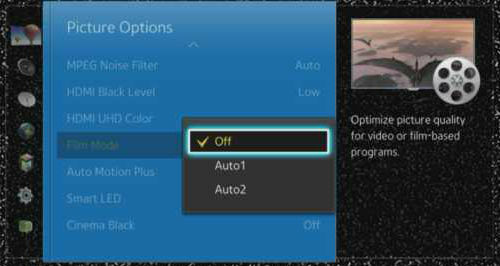 Auto 2: applies Film mode only to the portion of the picture that is in 3:2 pulldown. What is Game Mode and how do I enable it on my Samsung TV?